I just took a quick look at this game and here are the cool stuffs. 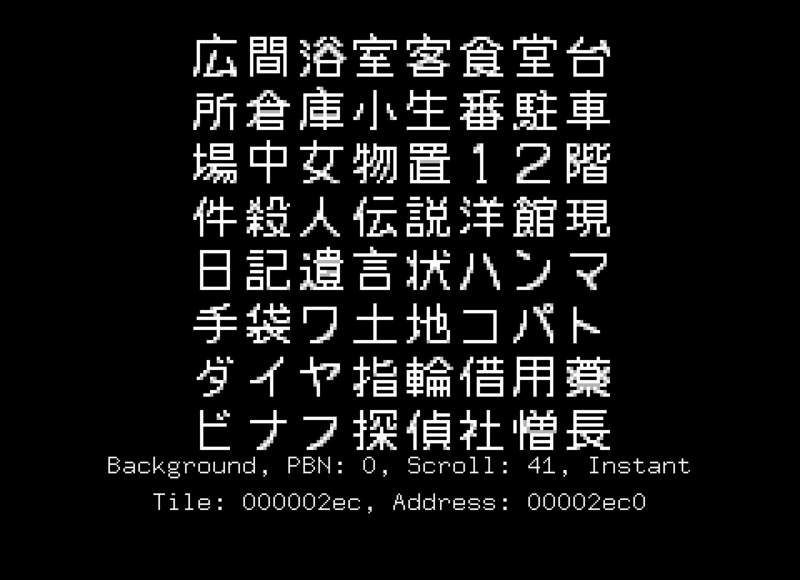 The games has 2 fonts, an 8x8 one with numbers, symbols, upper case and 8x8 kanji (I think), and a 16x16 one. The text for the introduction starts at $4dc49. The date 1921 is stored in plain ascii. So I brutally wrote some stupid text in upper case and voilà! I identified 2 special chars : $fc for newline $fb which indicates that the next byte is one of the 16x16 symbol. About the code: I made a quick read and it seems that it comes in 2 part. First the text is read from ROM and put in an array in BSS ($9bb6 to 9bc5). The drawing parts happens around $9d84 ($2a $2b are set at $9bd5). It seems that all the strings are contiguous. Let's call this area "the string space". So this space is divided in blocs. Each bloc seems to start with a 3 bytes header. The introduction one ($4dc46) starts with $01 $fe $fb. If you look a little bit farther in the ROM you'll find $02 $fe $fb and so one. So there must be some place telling the game which bloc to use. If we put a read breakpoint on $4dc46 (use *8dc46 on Mednafen), we end up at $9b13. The string table (or what's close to it) is getting closer! 8x8 font table (hope it's readable by everyone). 0 1 2 3 4 5 6 7 8 9           ? 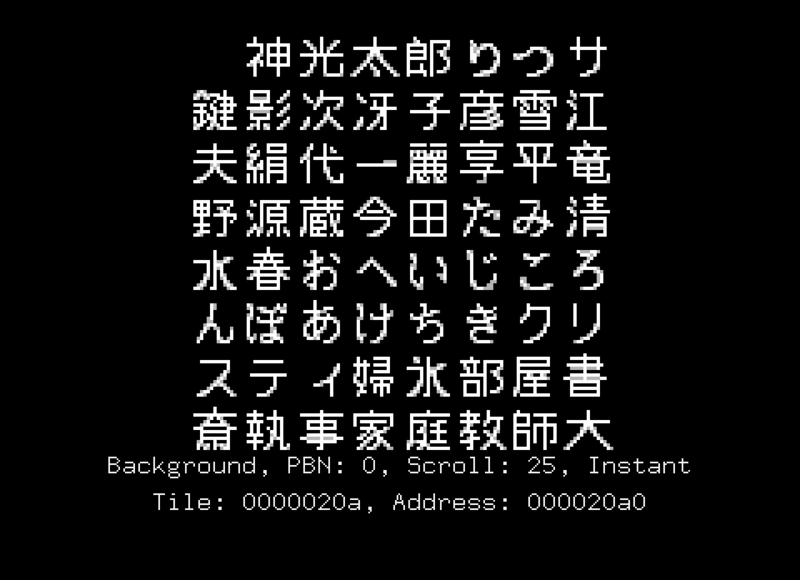 It looks like the full-width roman characters and half-width katakana with some hiragana between them. I was unable to decrypt/identify the first "smaller" hiragana (the one under V in the image). I'll be glad if someone figures out what the 16x16 font are. Obviously they are kanji. But which part of shift-JIS subset are they? I found this kanji. 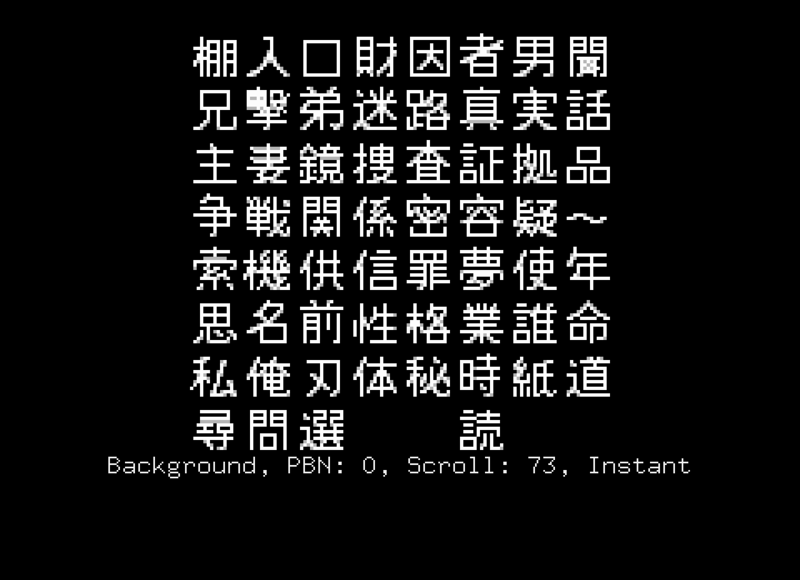 I think I'll have to look at the string parsing and hope it'll reveal how to identify the associated kanji. This search page is cool. I think I found the first kanji. 神 光 太 郎 ? つ ? 夫 絹 代 一 ? ? ? ?
? ? ? ? ? 部 ? ? In order to make things short, this codes scans the area pointed by $06 until it finds #$fe. Remember our header ($01 $fe $fb). So it first read $01. Stores it in $0e and jump to next byte (that's what the routine located at $9c74 do). Next #$fe is read. We are out of the loop. Then comes the interesting part. It checks the value of $0e against $33dd (it's in RAM). If they are not equal, it will resume the bloc scan until a matching header is found. Oh, so it's doing a 'seek' through the block of strings then? Yes, but for what I saw (only the first 2 blocs) $06 is initialized so that it points directly to the bloc header. It seems that graphic data are encoded using a simple RLE scheme. The lowest 4 bits holds the palette index for the current pixel and the highest 4 bits, the count. Another interesting fact is that graphics are not tile encoded. But they are stored as standard bitmap ie line per line. 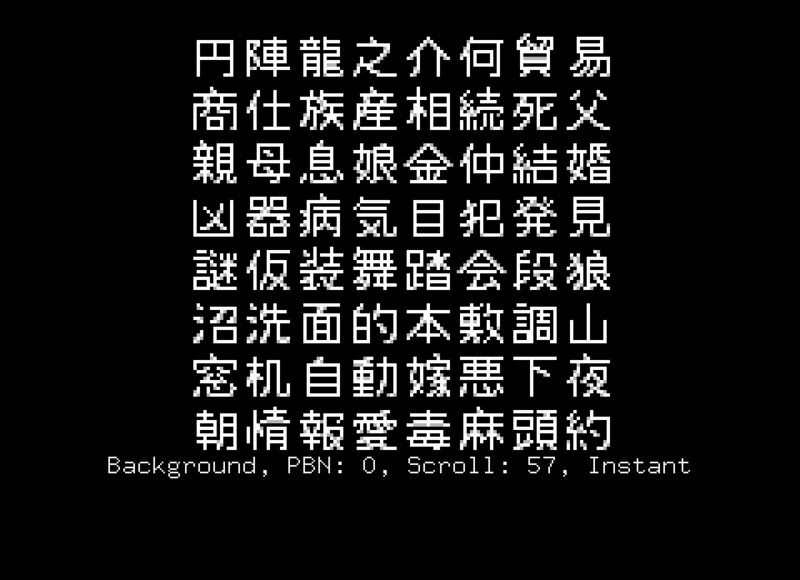 Here's a small C program that will extract the roman, katakana and hiragana font set. 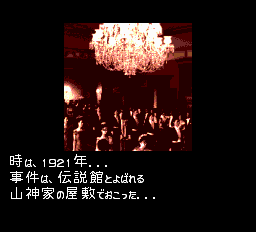 It seems that it has been encoded as a 128x128 bitmap. The output is encoded in PPM ascii. The table for graphic data is around 0x442BA (rom file offset). For example you'll find 13 00 60 18 there. The first byte is the bank where the data is (13). The second byte is ignored. Then comes an offset $1860. In the code ($9576), you'll see that #$40 is added to the high byte (stored in $07). And if you translate the pointer, you have $1860 + ($13 << $0d) + $200 = 27a60. 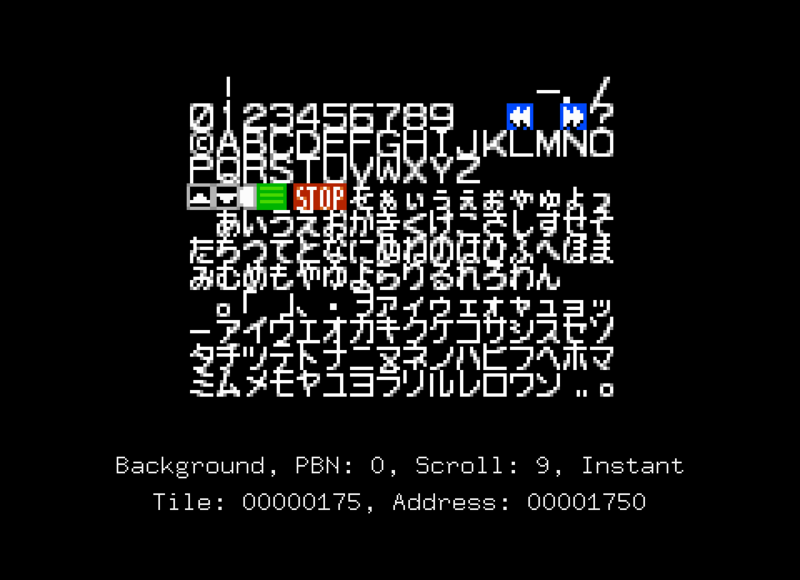 The rom offset we found previously for the roman/hiragana/katakana font! We can now relocate data if we want. Cool isn't it? The people on the Romhack.org forum are awesome! 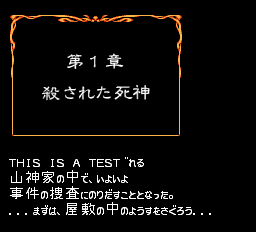 Fist, TiDragon fixed the hiragana/katakana. Here is the first version of the font.